The teaching position was created by bequest: Edwards died in 1892, and in January 1893 her favourite archaeologist in Egypt, William Matthew Flinders Petrie, became the first Edwards Professor of Egyptian Archaeology and Philology, at the age of 39. The bequest was offered to University College London, in preference to Oxford and Cambridge, because at that date UCL was the only place in England where degrees were given to women. As part of the bequest, Edwards left her collection, the core of what is today the Petrie Museum. Numerically it is overshadowed by the quantity of finds from Petrie excavations, and the collection that Petrie himself formed from his purchases in Egypt and Europe. In the history of science, Edwards predates the development of archaeological techniques of recording information at the moment of finding an object. Precisely for this reason the Edwards collection forms an instructive contrast to the later acquisitions from excavations. In addition to some remarkable highlights, it offers a guide to the general range of material in a standard collection of a mid- to late nineteenth century enthusiast for ancient Egypt. Disentangling these components is an important task for the history of this collection, within the assessment of relations between Egypt and Europe in the heyday of colonialism. The Petrie Museum archive includes an undated leatherbound book of gilt-edged squared paper, with the title 'Catalogue of Egyptian Antiquities Books &c.' on the front cover. Many pages are blank, but twenty have pasted sheets of paper on which Petrie himself had compiled printed summary information on objects (a duplicate of one page is also present, loose), and another five are full of handwritten entries. Unfortunately there are few dates of acquisition, though most references on printed pages are to sites visited by collectors or to excavations in the 1880s; this suggests that the focus of the volume is the Edwards collection. Only one item in the printed pages comes from a site excavated substantially later, a blue and black frog figure said to come from Rifeh, not excavated until 1906. Clearly, then, not all items even on the printed pages were already in the collection at the time of her death in 1892. It is also not certain that most or all objects in her collection had been included in the inventory. The printed pages were designed to be repeatable: for one page there is a loose extra copy in the book. 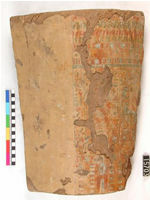 The same block of information on an object might be cut from a duplicate page for use as a label, and when the label and mount survive with the object, it can be identified as probably from the Edwards collection. Theoretically the same block of information might be printed out for more than one object, and new acquisitions of the same form might not be distinguishable. Despite these complications, the printed pages and briefer handwritten notes on larger items provide a general indication of the range of material ascribed to a separate part of the collection, most likely around the core of the collection of Amelia Edwards herself. Since the Rifeh frog is the only item likely to be from a post-1900 excavation, it is possible that the inventory represents a modestly expanded version of the original inventory of the Edwards collection that Petrie had begun for her during her lifetime. 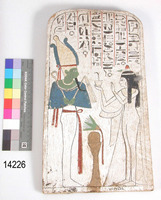 Compare the following summary of the inventory with the vague description by Edwards herself as 'my collection of ancient Egyptian jewellery; scarabs; amulets; statuettes of Deities in porcelain, bronze, and stone; funeral tables; sculptures; pottery; writings on linen and papyrus; and other miscellaneous monuments'. Which of those categories is entirely missing in the inventory?